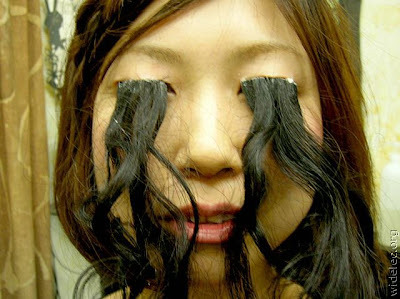 I don't know what she was thinking, she should get more convincing eyelash extensions. You can tell they're fake because they don't match her hair color. either that or her hair doesn't match her eyelash color. when was the last time you saw a japanese person with a natural hair color other than black? exactly. It's from Sion Sono's movie called Ekusute. The film is about hair killing people. who says she got eyelash extensions?